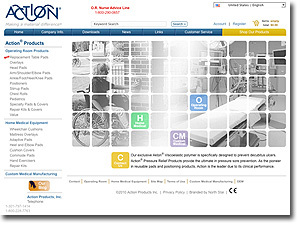 North Star facilitated the complete redesign and development of the Action Products website, now featuring a robust Content Management System (CMS) and North Star's proprietary e-commerce platform. Additional features include an interactive and 'adminable' Flash component on the homepage, an international locator, click-to-call, predictive search, and much more. Restructuring of product data, implementation of initial SEO content, and integration of Google Analytics were included in this project as well.